Google is everywhere. It is nearly impossible to go through a day without interacting with a Google product — from Maps to YouTube. 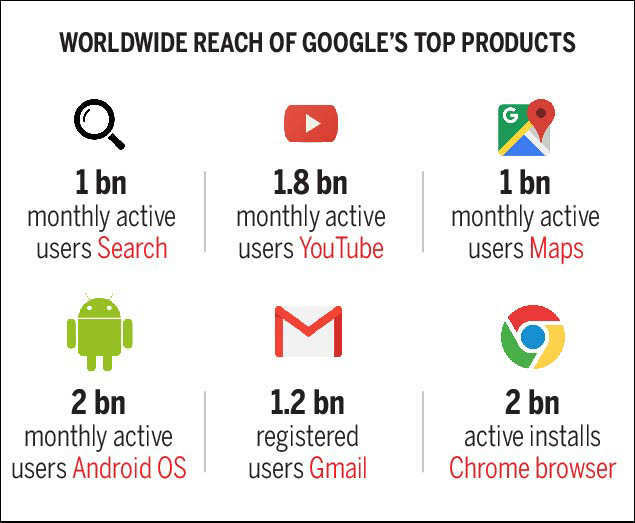 Google’s video platform, email service, and map application have over 1 billion monthly active users each. It’s sheer ubiquity means the technology giant has ample opportunity to collect data on you, whether you like it or not. 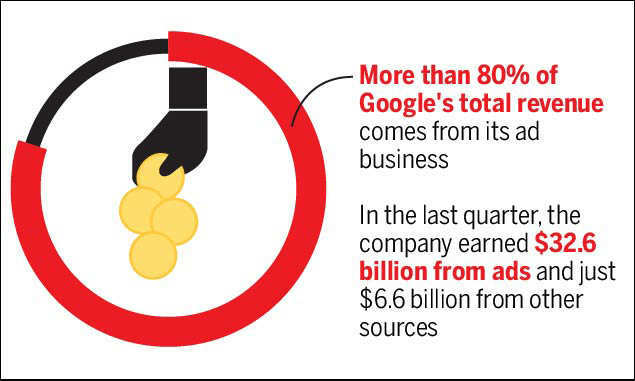 Here’s a look at how much Google knows about you and what it does with that data. 1.ACTIVE COLLECTION: When consumers consciously interact with a Google product and provide it with personal information, like signing in to YouTube, Gmail or Search. 2.PASSIVE COLLECTION: The less obvious method that sometimes collects data without the user’s knowledge, including apps running in the background, Google’s advertising tools, platforms such as Android and Chrome, and publisher tools. With its two methods of data collection across its many products, Google is able to learn about our behaviour, both online and in the real world, and build a comprehensive profile on us. Commute to work: You walk to the nearest Metro station to catch a train to work. On the way you read the news and listen to music. * SEARCH FOR NEWS: Your search history is recorded by Google and used to identify your interests and recommend similar content or specifically target you with ads. * LISTEN TO GOOGLE MUSIC: Much like Search, the music app records the kind of music you’re interested in to build its profile on you to send targeted ads. 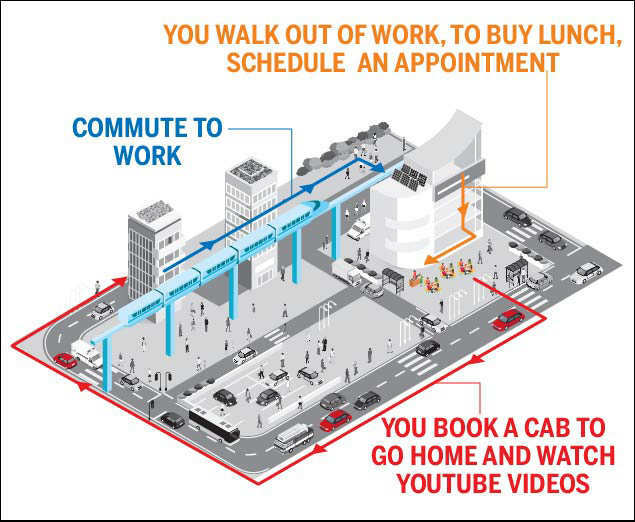 * GO OUT TO BUY LUNCH: Google collects enough location data to tell if you’re walking, running or in a moving vehicle. * PAY THROUGH GOOGLE PAY: Google Pay not only has your debit and credit card details, it also collects specifics of your transactions like the products you bought, how many items you purchased, and names and locations of the merchants. * DOCTOR’S APPOINTMENT VIA GMAIL: Google scans your email to identify your interests. It can even track appointments based on contextual information in a mail. Google customises ads based on the contents of emails you send and receive. * YOUTUBE: The video platform records what videos you watch and where and when you watch them. It tracks you even if you watch a YouTube video on a non-Google website. * RIDE-HAILING APP: On Android devices, Google gets notified even when you use third-party apps. 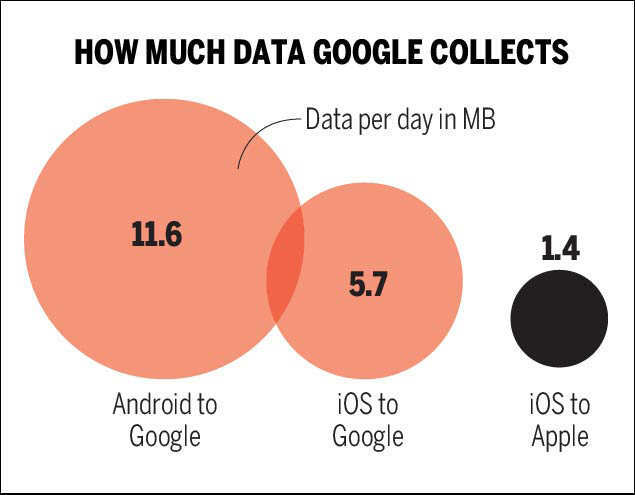 Google Android and Chrome are key platforms in Google’s data collection drive. Android has over 2 billion monthly active users worldwide. Android helps Google collect personal user information, monitor activity on the mobile phone (e.g. apps used, websites visited), and determine location coordinates. The Chrome browser helps Google collect user data from both mobile and desktop devices, with over 2 billion active installs worldwide. Both Android and Chrome send data to Google even in the absence of any user interaction. Even on a non-Google OS, like Apple’s iOS, Google has considerable access to your data, largely through its advertising services. Combined with its expansive reach, with billions using at least one of its products every day, Google not only personalises your user experience, but is also able to mint money from targeted ads based on data it has collected on your activities and interests.